Continuing from part 2 this final article will show you how to make the pieces move by drag and drop and adding some game logic. Note: Unless specified otherwise, the file you need to edit will be BoardController.js. We just check if the mouse event happened inside the board’s squares area. If you test in the browser now you’ll see that you can only manipulate the camera by dragging outside the board (or on its margins). Besides storing the actual piece object, we need to store its position also to be able to make a move or to put it back where it was on illegal move. While moving the piece, we also remove the piece from the destination position if necessary. Now you can try moving the pieces in the browser. 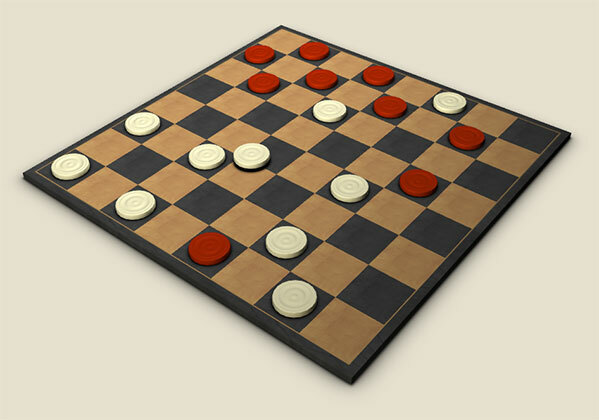 You should be able to move them freely on every square you want and if you drop them outside the board area the pieces will be placed back to their initial position. Instead of just moving the piece, on line 12 the pieceCanDrop callback is called to check if the piece can be dropped on the requested square. If returns true the piece is moved and the pieceDropped callback is called to allow the Game to remove the captured pieces. The function restricts a piece movement only to diagonal jumping by 1 or 2 squares. In the case of a 2 squares jump there must be an enemy piece in the middle. That’s all folks! If you want to experiment more you could add some improvements to the game, like complete game logic or making the captured pieces fade out using tween.js. If you have questions, suggestions or improvements don’t hesitate to add a comment and let me know about them. I was wondering under which license your tutorial sources are published and whether I would be permitted to use the sources as the basis for a public open source project on GitHub? We are glad to hear that you liked this set of articles. Everything published on the blog section of this site is available free of charge to anyone that finds any use for these resources. So yes, you are more than welcomed to use elements from these articles in your open source project. The only way you can say “tanks” is to link back to this site on your project, but this is entirely up to you. We wish you the best of luck with your project and if you want to please let us know when you publish something, we would love to see your work. 1) Now, king is only move one place. For our people, we would like to change king movement that can go end of the line they can move. And eat all on this line. 2) Now, we are dragging on pieces. But, we would like to click on it and suggest the places where we can move to. Please how to participate with you, bro. suggest to me.